I'm just now realizing I never actually posted a review of Uncle Funky's Daughter (UFD) Curly Magic Curl Stimulator! Love this stuff. Best gel I've ever used, hands down, no competition! Product Claims: Flex your supercurl muscle naturally with our aloe-based, firm hold curl enhancing gel. Curls become more defined and manageable with a nourished, brilliant shine. Curly Magic delivers superior results of taming frizz, elongating curls and adding moisture all in one powerful product. For best results, use with Squeaky Deep Cleanser, Richee Rich Moisturizer and Thirsty Curls Revitalizer for the next day. Ingredients: Organic Aloe Vera Juice, Aqueous-Infused Extracts of Marshmallow, Chamomile, Nettle, Horsetail, Vitamin E, Agave Nectar Extract, Citric Acid, Potassium Sorbate and Natural Fragrance. 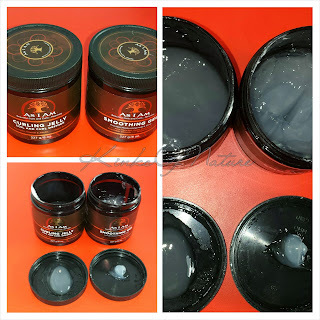 Thoughts: UFD Curly Magic Curl Stimulator is one of those mucus-like gels; it has a very slippery and sticky consistency with a light citrus fragrance. It provides a medium-strong hold. I can get at least a 7-day wash and go when I use this. There is bit of crunch the first day, which I don't mind, but in the following days it does soften. If I'm using a gel with a softer hold, I use this on top to make the style last longer. If I need to refresh a wash and go (too much frizz on top), I section off that part spritz and apply a little Curly Magic. I've used it on top of several leave-ins and gels, never had a problem with flaking. This is the only UFD product I've tries so I can't comment on how the products work together. UFD Curly Magic Curl Stimulator retails for $25 for 18oz ($1.38 per ounce). I can get 20-30+ uses out of one bottle depending on how I apply it and what other products I'm using at the time. UFD recently had a 30% off sale so I was able to get a couple more bottles! 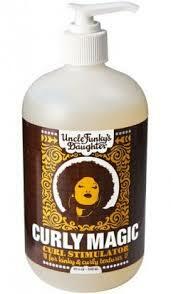 You can find this on the Uncle Funky's Daughter official site, and select local retailers. To find a store near you, click here.